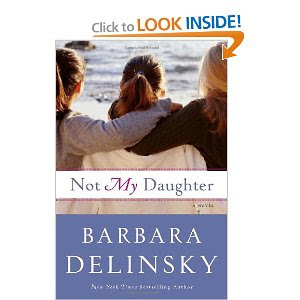 I just finished Not My Daughter by Barbara Delinsky last night. According the Publishers Weekly, "Delinsky proves once again why she's a perennial bestseller with this thought-provoking tale of three smart, popular teenage girls who make a pact to become pregnant and raise their babies together. Lily, Mary Kate, and Jess also happen to be the daughters of best friends Susan, Kate, and Sunny, and the mothers are thrown into a tailspin by this unexpected news. Susan, the principal of the town's high school, has the most to lose, when the schools superintendent and editor of the local newspaper question her abilities as a leader and mother, and other parents prove quick to blame her—a single mother herself who got pregnant as a teenager—as a poor role model. But all three women must come to grips with where they failed as mothers, how the dreams they had for their daughters are disappearing, and scathing smalltown judgment. Timely, fresh, and true-to-life, this novel explores multiple layers of motherhood and tackles tough questions." The premise of this book seemed great. A pregnancy pact? The inner psychologist in me was thrilled to read this. Halfway through, I almost stopped reading it. It was that predictable. The author could have done so much with this book. There could have been scandal, there could have been drama, and there could have been more talk about the girls and why they decided to have babies. The actual "pact" is mentioned about three times in the entire book and reasons for it are inane. In fact, the most dramatic occurrence in this book occurs when a high school principal has to rally her friends to keep her job (boring)! We heard almost nothing from the pregnant girls themselves and the whole book was a little too Pollyanna for my liking. Of course all three girls would keep the baby! Of course all three moms would accept the babies! Of course the girls would finish high school and go off to a local college next year! I would have prefer to read this book from the perspective of the daughters. I wanted to know why they did it, what hardships they endured at school, and why they would attempt to form such a pact. The entire book left me pretty dissatisfied. I'm thinking that perhaps this particular author is not for me. I tried reading her other book, The Secret Between Us, and couldn't get past the 50th page. It just didn't grab me. This one didn't either.